Caren Vietta Calder is a dancer, storyteller, percussionist and yoga instructor. Her professional dance career began in upstate New York with Garth Fagan’s Bottom of the Bucket, But… Dance Theatre, and then with Lois Welk, Bill T. Jones and Arnie Zane of the American Dance Asylum. Her training expanded from modern and improvisational dance to African/Caribbean dance with Pearl Primus and Percival Borde. Her return to NYC launched her fully into West African dance with the Chuck Davis Dance Company, Forces of Nature Dance Company, Iyataiye Dance Company and Harambee Dance Company. Coming full circle, she repeatedly appears with the improvisational performance piece, “From the Horses Mouth,” created by Tina Croll and James Cunningham. Her union with Women of the Calabash (founded by Madeleine Yayodele Nelson) brought her singing and percussion to Lincoln Center, Carnegie Hall and Town Hall. 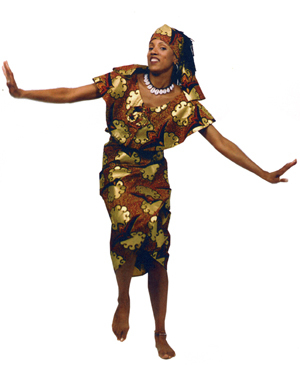 Previously an adjunct professor at Borough of Manhattan Community College and a dance consultant with the NYC Housing Authority, she has taught African dance to children through the World Dance Heritage Project (a project of Lotus Music & Dance Studios that provides teaching residencies to private and public schools). Caren is a certified instructor in basic level Hatha Yoga and Therapeutic Yoga, and currently teaches at North General Hospital’s Supportive Housing Unit and Harlem School of the Arts. She provides Professional Development Workshops for schoolteachers and administrators in yoga and African dance infusion across the curriculum. Ms. Calder is Artistic Director of Indigo Arts, a family-based company providing music, dance and storytelling from the African tradition for all occasions. Indigo Arts has performed at the CUNY Graduate Center, the 60th UN Celebration at the Marriott Marquis, Martha’s Vineyard, weddings, and numerous schools within the Tri State area. Caren has appeared in various television programs including Dance Black America (PBS), Reading Rainbow (PBS) and Six Artists Who Are Woman (PBS).